33-year-old Indu Tamang is from Katunje, Nuwakot. She lives with her husband Bal Bahadur Tamang, two daughters and one son. Indu is a house wife and her husband is an army. Her elder daughter is in grade 10 and the younger is in grade 8. Her son is the youngest one studying in grade 2. Indu herself has studied upto grade 8 and left her schooling in grade 9 due to her family poor economic condition. As Indu’s husband is in army, he stayed most of the time outside village. Indu is responsible to take of her 3 children in absence of her husband. It is difficult for her to raise 3 children with the only income of her husband. She always wanted to learn some skills that may help her to support her family. 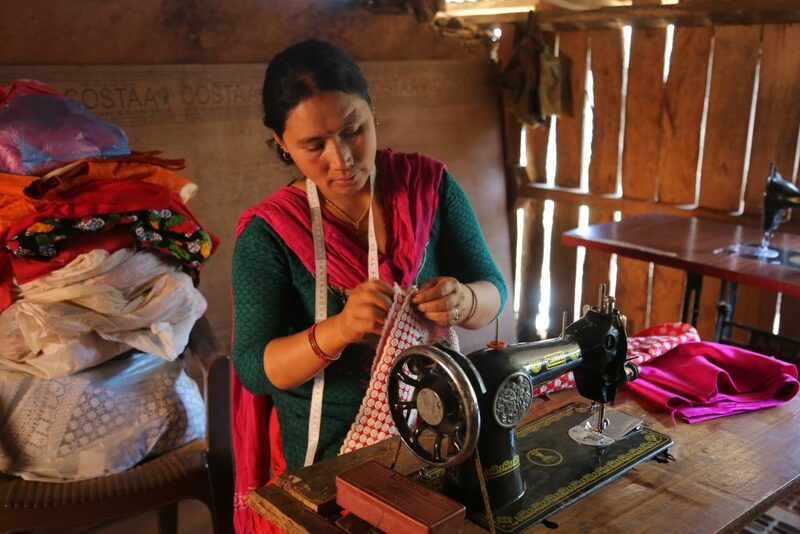 The year Kalika youth club was reformed by CarNetNepal, CarNetNepal given the responsibility to select two women from their club for the tailoring training. Indu Tamang is one of the member of the club was selected for the training. She completed her 6 months tailoring training course. After 6 months tailoring training Indu opened a tailoring shop near her home. She named it ‘Sunaulo Ladies Tailors’. CarNetNepal supported Indu with the sewing machine, thread, visibility board, cloth materials etc. to open the shop. From the tailoring shop she started to earn 600- 700 NRs per day. Her daily profit is 3-4 hundred rupees. Later Indu started to give tailoring trainings to other girls and women from her village. She takes 1100 NRs. for 3 months tailoring course and 1500 NRs. for 6 month course. 4 of her students have completed the tailoring course a few months back. Her journey from trainer to trainee is beautiful that inspire hundreds of women of her village and made them realized that women are no less than men.